REVIEW - Tick Tock Isle - Use a Potion! Every so often I’ll come across a game that looks intriguing and appealing to me, but I never get around to playing it. There are so many games available these days that it’s almost impossible to play them all, and it’s a real shame – I’m sure I’ve missed out on some classics. It almost happened with Tick Tock Isle, the latest release from developers Squiddershins. Whilst the game’s cartoon style caught my eye instantly, its tricky November release sandwiched between so many AAA titles almost meant I didn’t end up playing it. What a regret that would’ve been – Tick Tock Isle is one of the most enjoyable little games that I’ve played this year. 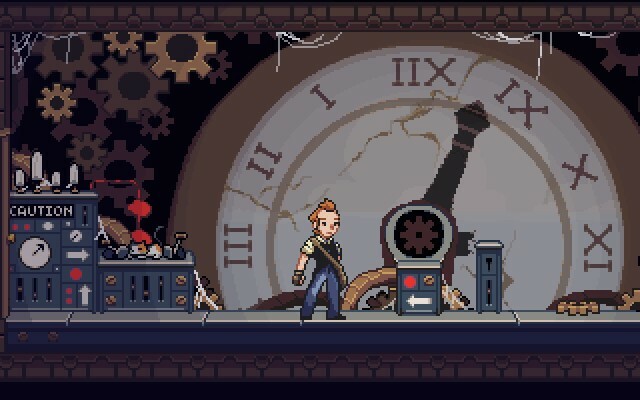 The story of Tick Tock Isle begins with hero Strike Mainspring arriving on an island to fix an abandoned clock tower. 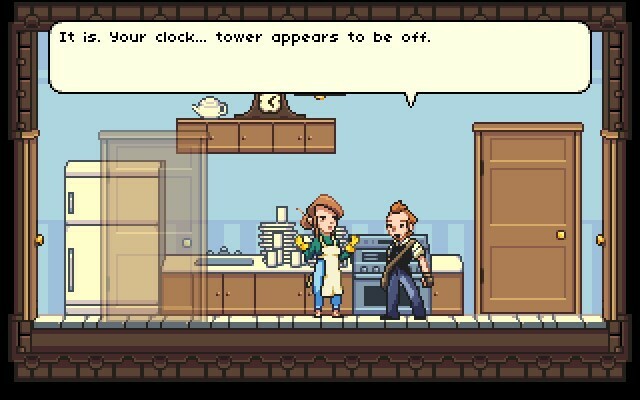 This isn’t just a ‘clock repair’ simulator though; the clock tower acts as a time machine that sends Strike back in time to when the clock tower was actually inhabited by a dysfunctional, yet charming, family. Thus begins Strike’s adventure to not only repair the clock tower and return to his time, but also fix the many problems of the tower’s new found ‘previous’ inhabitants. The story doesn’t really go into too much detail or offer a super rich narrative; it’s clear as you play the game that the main focus is on the colourful cast of characters and their wacky side stories. Whilst Strike has a quirky personality and is always delivering witty remarks, it’s the family that he’s trying to help that stand out the most. You have your stereotypical family members (a lazy Husband, an overworked Wife, an angsty Daughter), but there’s also the Sherlock Holmes-like Son and the zany, warring Grandparents. All the characters work well together, sharing humorous moments and always providing you with the most farcical of tasks – you’re often just left laughing at the absurdity of each situation. It’s the solving of each family member’s dilemmas that make up the bulk of the gameplay in Tick Tock Isle. Each family member has a problem that you need to fix – be it stopping the War that separates the Grandparents or helping the Daughter compose a beautiful piece of music. These may seem like simple tasks to complete, but that isn’t always the case; Tick Tock Isle’s main gameplay hook is that you switch between two different years of the family’s life to solve each puzzle. The feature works really well and it’s surprising how much will change in the one year difference of the time periods; you’ll notice that in one time period the inquisitive Son has a chart on his wall investigating the mystery of Strike’s time travelling antics, whilst perhaps that the clocktower is surrounded by snow in another. The integration with the puzzles is fantastic too – for example, in one time period you find an order form for a new lawn mower. If you put it in the post you’ll find that the family has that new lawn mower in the future time period. You can then take that lawn mower to the Husband in the past time period in order for him to start pulling his weight around the house and mow the overgrown grassy areas. Does it solve the puzzle? No – the colour of the lawn mower clashes with the Husband’s top, but you get the picture. It’s these clever instances where Tick Tock Isle really shines, and thankfully the game is full of them. Besides solving these puzzles, you’ll also be exploring the clock tower and its surroundings for items that you’ll need to progress. Though a pleasure to explore, sometimes things felt a little aimless – it was often a case that sometimes something would be somewhere where there was nothing before. Whilst this could be pinned on the ‘butterfly effect’ that plays such a big role in the game, the randomness in which some items appear or events occur often leaves you randomly exploring areas and hoping something has changed somewhere in order to progress. 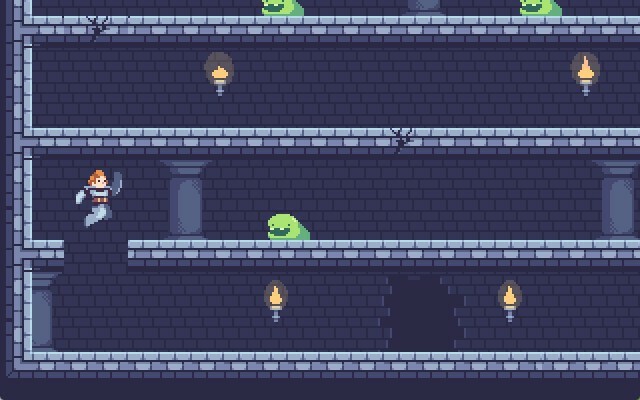 Besides a few enjoyable retro-styled mini-games (based on the likes of Ice Climbers and Prince of Persia), you won’t be doing much outside of exploring and solving these small puzzles. Yet, as you solve more and more of the puzzles and everything starts to come together, you’ll feel a great sense of satisfaction. The world visibly changes around you and it’s such a rewarding experience to witness it happen. Graphically, Tick Tock Isle does a good job of showing off the vibrant little island. It’s packed full of colour and detail, with little things like birds flying and clouds moving in the background bringing the world to life. 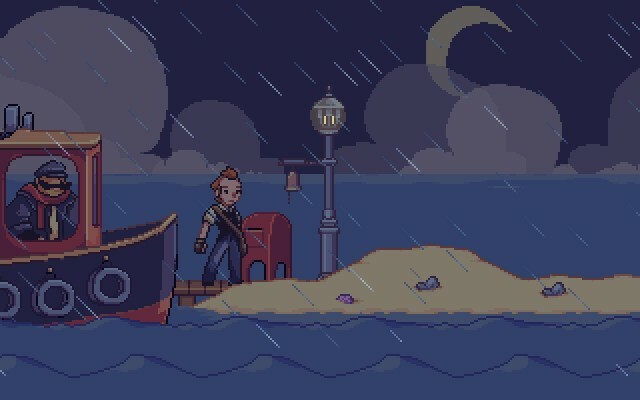 I’m a fan of 2D art, and whilst the game adopts a simple approach to its visuals, the colourful, charming world of Tick Tock Isle was a pleasure to explore. The character design is also neat, albeit very stereotypical. There’s nothing really original in character designs; even the main character reminded me of Tin Tin. That doesn’t mean characters don’t look the part though, and there’s certainly a consistency in the aesthetics. Besides the quirky puzzles, Tick Tock Isle’s sound design really stands out as one of its strong points. The retro vibe and charming feel to each composition kept me smiling as I played through the game. The music also changes up between time periods and also depending on whom you’re talking to; each composition seems to perfectly suit each character you’re speaking to or situation you find yourself in. I enjoyed the soundtrack so much, I actually looked to see if it was available to download – the composer did a great job. Perhaps one of my favourite things about Tick Tock Isle is all of its subtle references to pop-culture. You’ll notice characters referring to TV shows like The Simpsons, or maybe the Bill and Ted/Wyld Stallions posters that are found in one of the bedrooms. There’s even a pretty neat references to classic puzzle-platformer The Lost Vikings; Tick Tock Isle makes plenty of references to pop-culture and it’s a joy discovering them all. I’m glad I got around to playing Tick Tock Isle – it’s a quirky adventure full of neat puzzles, charming visuals and a fantastic sound track. It can easily be beaten in just over an hour, but it’s really low price point means you’re getting plenty of bang for your buck – though I will admit that it was a shame there wasn’t more to play. There are a few instances where you’re left aimlessly exploring in order to progress, but it doesn’t take anything away from what is otherwise a great, puzzling experience.